Our stalls are made by MD Barns. They are sturdy and safe. Eve height starts at 12' to insure a spacious feeling and adequate ventilation. 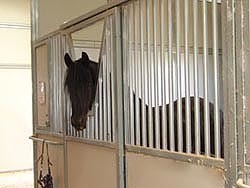 The stall fronts are panel and bars with a yolk door so your horse will not feel closed in. The bars on these stalls are close, very strong and tested; no hung up feet. Each stall has a blanket bar and a sturdy sliding door. The stalls have rubber mats, a large feeder with grain and salt holders and an automatic float controlled watering device. Adjoining each stall is a 12' x 50' run. They have mud barriers with a DG surface. Each run is constructed of sturdy steel welded pipe with an end gate. There is one rail at shoulder height for positive containment. Then each fence between horses has strands of electric rope; which is safe and visible. This design helps prevent many of the problems that occur with standard pipe fencing such as kick injuries, tail and blanket chewing. At the end of the paddocks are water troughs as a back-up to the automatic float controlled water trough. 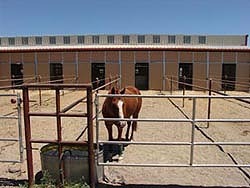 The paddocks are equipped with misters that operate in temperatures above 90 degrees so your horse is cool and comfortable during our valley summers. Groom, Wash, and Tack Areas are at a central station. Hot water at our indoor wash racks provides a comfortable wash. Individual tack lockers are provided. You supply your own lock, your belongings are secure. 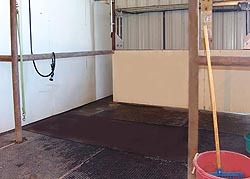 Cross tie groom areas have safe ties and rubber mats. Buffer areas make it safer for you and back boards make it safer for your horse. Fly Control is an important component of comfort for your horses. Manure management is a key element t of this. Our temporary pile is far away from the stables and we have it hauled away on a regular basis. We also have an automatic fly control system. Each stall has an overhead nozzle. It uses a safe and effective all natural spray that kills flies, mosquitoes and gnats. It is non- residual, ensuring safety for your horse and you. A Horse Shoeing and Vet Station is provided. It has extra lighting, rubber mats, water, electricity, and fly control.